In Sami language, the Northern Lights are called “Guovssahas”, which translates to “The Light that Can Be Heard”. Acrylic paint, ink, powdered pigments and resin make up this mixed media painting. Powdered pigments give the illusion the lights dance across the sky like moving sand. Available through Benko Gallery. 24"x48", painted 2" edges, wire backing and ready to hang. This painting explores spacial suspension, color and depth. This is a mixed media painting on canvas with layers of resin between paint. Significant depth is achieved by layering resin, and the final finish is high-gloss. Bits of gold leaf are mixed in the paint as well for added texture. Available through Benko Gallery. 36"x48" mixed media on canvas. 2018. Messier 15, 48”x48”, layers of acrylic, resin, iridescent powder pigments, and ink. Layers of iridescent powder pigment in between the resin give this piece a 3-D feel when viewing in person. The powder pigments also give a hologram effect; the colors change depending on which angle you are looking at it. Painted 2” edges. Wired backing and ready to hang. Completed in 2018 in partnership with the Astronomy Department of Carthage College, where students obtained and supplied data from Kitt Peak Observatory. Using astro-imaging software, I manipulated layers of data, to eventually arrive at my own interpretation, exploring the “human factor” in data representation. I wanted to convey a warmth that we often don’t often associate with the mysterious, dark and desolate cosmos. Messier 15 is one of the oldest star clusters in our galaxy, so the warm palette was appropriate. Static Electricity buzzes with energy while it explores elements of suspension and movement. As an artist, I enjoy capturing and depicting energy; what can’t we see with human vision? Visible light is just a fraction of energy we see on the electromagnetic spectrum, which leads me to further explore the vast possibilities of colors in space. This painting was created in an Abstract Expressionist approach; many layers of paint were applied with the canvas flat on the floor, utilizing acrylic inks and paint. Protected with a gloss medium. Original painting measures 36"x48", with a white edge wooden frame. 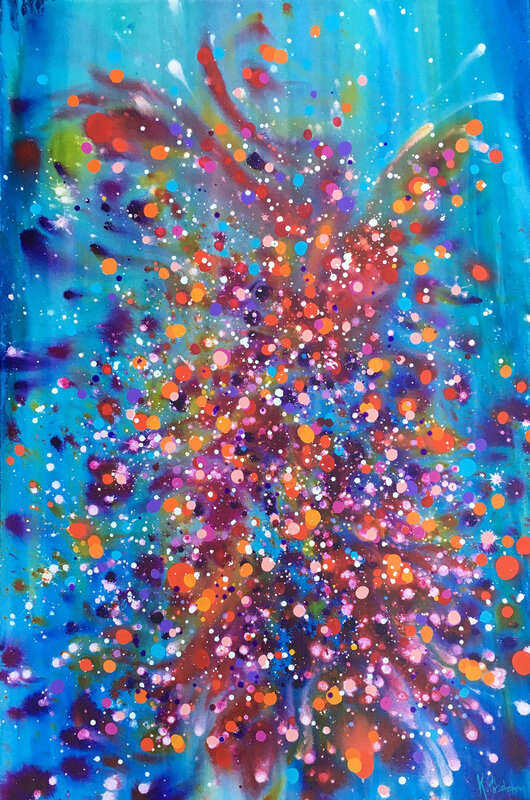 Combining layers of pointillism and abstract expressionism, Alchemy is meant to capture a fragment of energy while uplifting the viewer with it's warm palette. “Alchemy” 36x24” acrylic on canvas. A Dance with Time and Space explores the way one moves through life; a dance with time, expressive and organic. An uplifting palette with fleeting color and movement. Available through Benko Gallery. Original painting measures 36"x24" with painted 2" stretcher bars is varnished, and ready to hang with wire backing. I find the energy of Lake Tahoe always offers a surreal, mystic experience. Capturing movement and energy at dusk, this painting combines abstract work with a splash of realism. This is the first of many Tahoe-inspired paintings to come. Available through Benko Gallery. Completed in 2018. Measures 24"x36" with 1.5" painted edges. Varnished and ready to hang with wire backing. Mirroring the cosmos, reef life, and a blossoming flower, In Bloom represents the light and mystery of the night sky. Painted flat on the floor with layers of washes of paint give this piece a watercolor-feel. "In Bloom" Acrylic on Canvas, this piece measures 48"x36" with painted 2" edges. 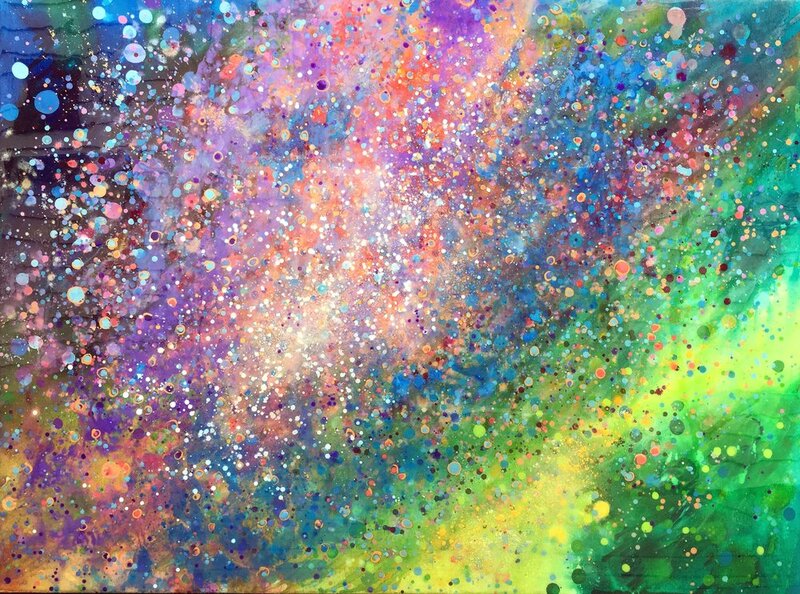 A whir of dots layers over washes of paint, illustrating the vibration of the sounds made by insects on a midsummer sunny day. The colors and brush strokes are representative of the alive, lush landscape along the Saco River in summer. Inspired by the landscape of Pine Hill Community Forest. Sounds of Winter Acrylic on Wood, 20”x20” completed in 2019 for the Upper Saco Valley Land Trust’s Art Celebrates Place.